An arm detached from the body is just a dead and useless body part. 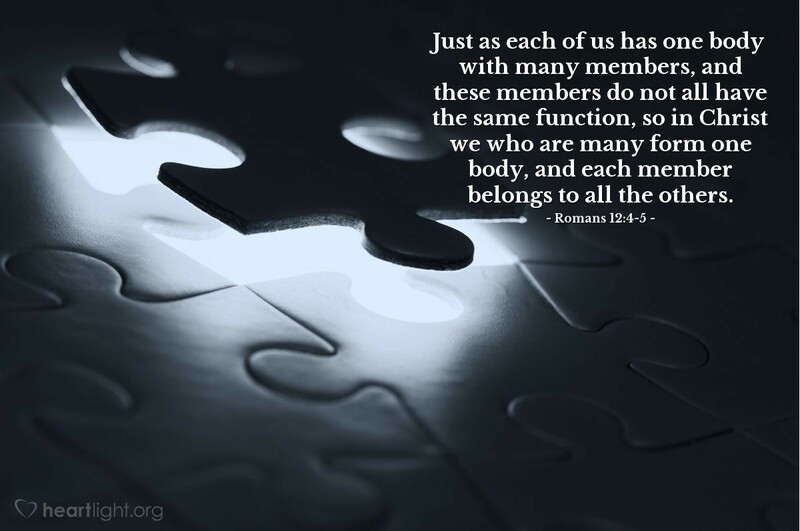 We belong to each other because we belong to Christ. We find our freedom to be what God has made us to be, and the Body finds its power and usefulness as we each offer ourselves to be used for the good of the Body and the work of the Lord. Dear Father, thank you for making me a part of something that is living, dynamic, powerful, and eternal. Thank you for giving me special abilities and gifts to use in the Body of Christ. Please help me find and use my gifts and abilities for the good of your people and to glorify you. In Jesus' name I pray. Amen.